Irish soccer shirt features a shamrock along with an Irish flag shield appliqué. The Irish soccer jersey features a light-weight Breathlite material with sublimation print that includes an embroidered Irish flag and shamrock shield on the left chest along with an embroidered Irish flag on sleeve and IRELAND just below the rear collar. The Irish soccer shirt is green with white pinstripes and features both printed and embroidered designs. The Irish soccer jersey sports a clean and refined look that is classic yet modern in its detailing and is available in adult sizes extra small through 3XL. This soccer jersey is received with a shamrock history card, complements of The Irish Gift House. 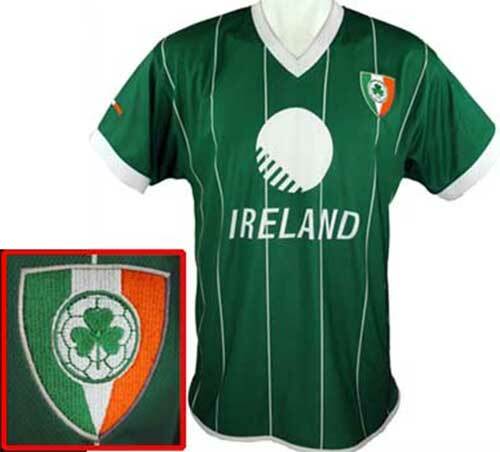 Irish soccer jersey is a green shirt that features Ireland printed boldly across the chest.